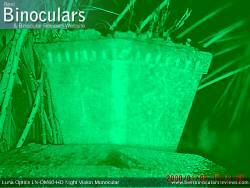 Digital Night Vision has progressed a long way since I first started testing them over a decade ago. Back then, digital NV was mainly seen as a cheaper, but less desirable alternative to standard analog instruments using photocathodes and phosphor screens. 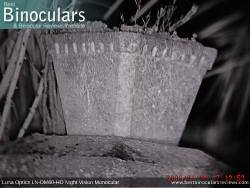 This has changed and now good quality digital night vision devices can match or even surpass the equivalent sized Gen III instruments in terms of their image resolution at night. On top of this, they are often less expensive and you get the added bonus in that many digital devices make it very easy to record what you see. 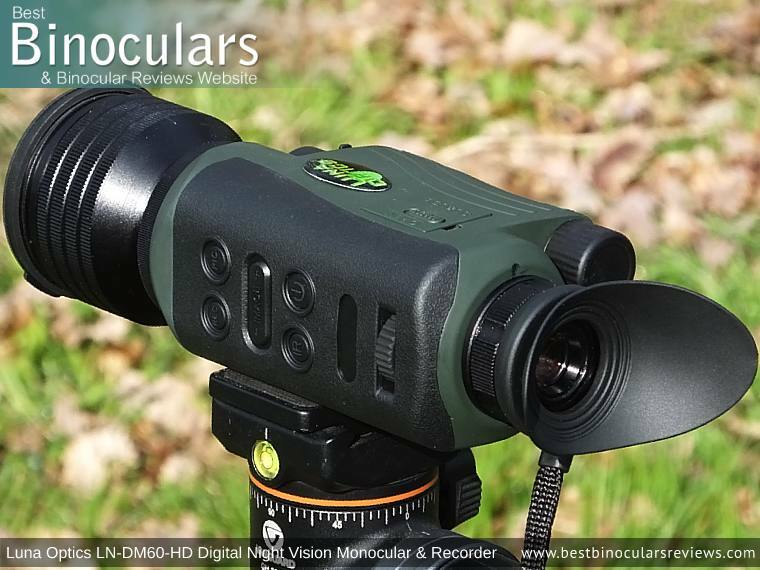 So with this all I mind, I was very interested and indeed more than a little excited when I had the opportunity to get my hands on the new flagship Digital NV Monocular from night vision specialists Luna Optics as I was keen to see just how far they had progressed from their earlier models that I have used in the past. 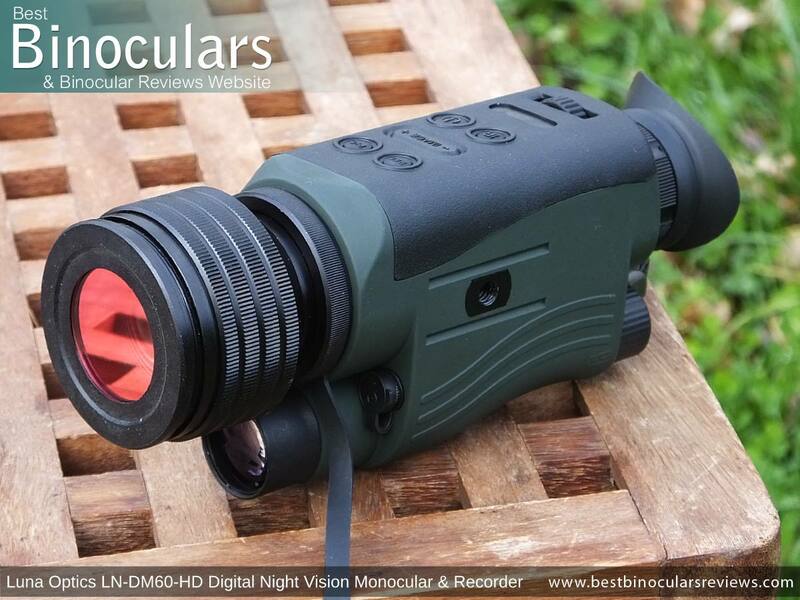 The Luna Optics LN-DM60-HD is a Digital night vision monocular and differs to the analogue ones in that the collected light is converted into an electric signal with the use of a CCD image sensor. This sensor is extremely sensitive and thus can increase the light, producing a visible image onto the LCD screen which you look at through the eyepiece. The main advantages of this over standard NV include being far less expensive and the ability to easily record the image produced onto a memory card. Another major advantage is that it can be used during the day without fear of damage. 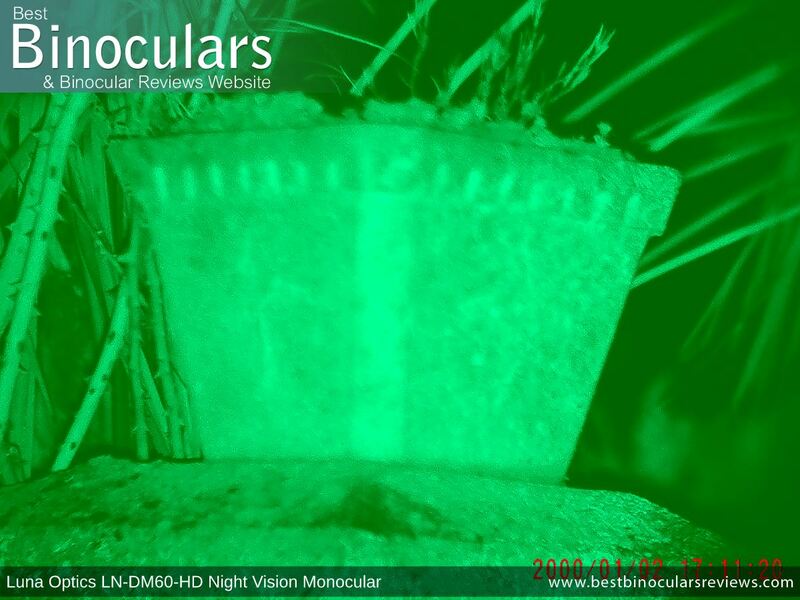 For info take a look at this section on How Digital Night Vision Works. 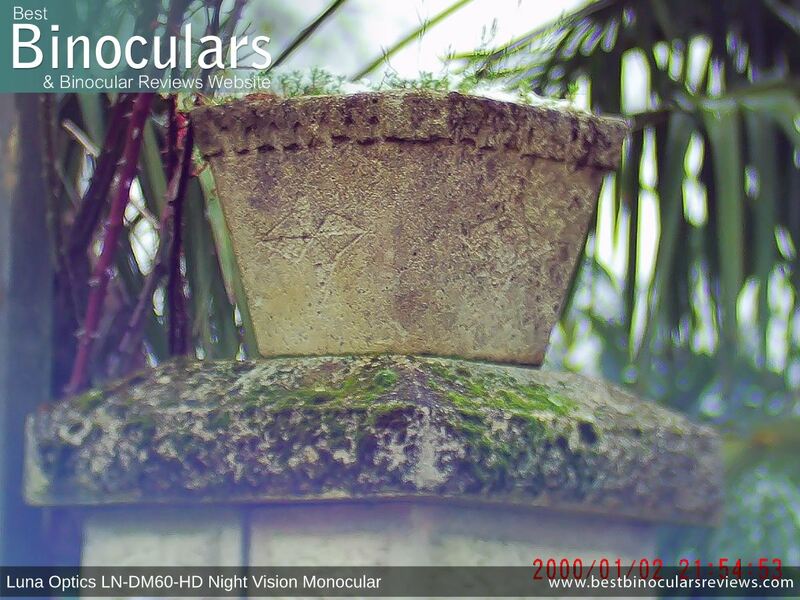 The design and overall body shape of the LN-DM60-HD is very similar to that of Luna Optics older models, like the LN-DM50-HRSD for example. Indeed this is a fairly common design across most digital night vision monoculars and I guess you would say it is tried and tested as in many respects is quite similar to a standard camcorder in that you operate it using just one hand. The outer surface of the main body has a rubberized coating. This is probably a little too thin to provide much in the way of impact protection, but it certainly adds to the level of grip, some weatherproofing and because it is less reflective than a hard metal or plastic surface can help with night time camouflage. 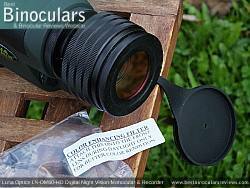 At the rear of the monocular, you find the eyecup and the eyepiece. The eyecup is made from a soft thin rubber and has a diameter of around 42mm. I really like the eye flap/eye shield as it does an excellent job of blocking out any light or distractions from the periphery of your view. Note: This flap can be folded down should you not want to use it, of if you wear glasses. It can also be rotated so that it can accommodate either your left or right eye depending on your preference. On either side of the eyepiece is areally small LED light. The right one lights up in a green color to indicate when the instrument is powered and the left one glows red when you turn on the Infrared illuminator. Note that their position on the rear and their tiny size are both deliberate as this ensures that they do not interfere with your viewing and help to not give away your position. For security uses, these small details can be very important. As with most of the other Luna Optics digital night vision monoculars that I have tested, the LN-DM60-HD is powered by 2 x 3V Lithium (CR123) batteries. However what is new is that this device now also comes with a battery charger and so you can get yourself a couple of rechargeable batteries which is great. Note the included batteries are not rechargeable. To access or install the batteries, you unscrew the spring mounted caps. Note do this at home and do not try this in the dark out in the field as it would be very easy to loose one of them! I read in the manual that this Luna Optics LN-DM60-HD NV monocular will operate for between 2.5 to 3 hours on a set of batteries. Obviously this will depend on many factors, like the quality of batteries used, how much you use the IR etc. But I would say that this is about right as I only started to see the battery indicator approach zero after around 3 hours of testing. 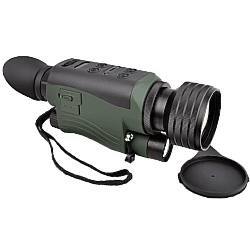 This is where you find all the main controls for this night vision monocular. This location is different to some and most camcorders which have the controls on the side. The advantage of it being on the top is that you can operate the unit with either your left or right hand. The wheel that is just positioned just in front of the eyepiece enables you to adjust the exposure and thus the brightness of the image that you see to suit the conditions and your personal preferences. The two buttons located just fore of this wheel are for turning the unit and IR illuminator on or off. Then further forward there is a rocker switch, which is the zoom in and out control and after that are the buttons for taking still pictures or video. What I would say that for normal "warm" conditions and daytime use the buttons are well laid out, reasonably well spaced and are straightforward to use. For night, it is very important to learn which ones do what before going out in the dark. Firstly the buttons are not pronounced or obvious enough for you to be able to locate the desired one and operate it with gloves on. Then even with your gloves off, once my hands became very cold (I was using then in sub zero (°c) conditions, I really struggled to feel them all that easily. With practice, I did get better, but personally I would like the buttons to be far more pronounced and easier to use. As you would expect, this is where the objective lens that collects all the available light is located. You also have the IR illuminator positioned just under it. In-between these and on either side are two output ports with tethered rubber covers on them. One is the video output and the other is the DC output, which is great as it enables you to power the unit using using mains electricity and not the onboard batteries and is perfect for longer periods of use. Compared to the other surfaces, the sides are relatively uncluttered. One one side you have the accessory or tripod mounting thread. For tripod mounting, it is a little strange to have it mounted on the side and does take a little getting used to, but is not a major deal and if it does bother you, you can get an L-shaped bracket to rectify this. From here you could also attach something like an extended range IR Illuminator (like the LN-PB3). 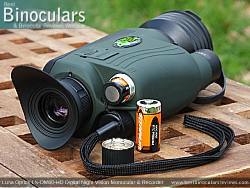 The Luna Optics LN-DM60-HD monocular takes a standard Micro SD card. This is where the videos and still pictures are stored. It comes with an 8GB card, but can take ones with up to 128GB of memory. Here you also find a USB output. Luna Optics do include a cable which then connects onto their DC adapter and thus power the device or you can connect it to your laptop or computer to power the device. I had thought that this would also allow me to access the images and videos on the card, but I was not able to. I am not sure if this was just me or if it is just used for power? I will update this as soon as I find out as there is no mention of it in the instructions. Whilst a little bigger than the older LN-DM50, the dimensions of the DM60 (7.6"x3.3"x2.3") are still perfectly fine and ensured that it was no problem for me to hold and operate with just one hand. 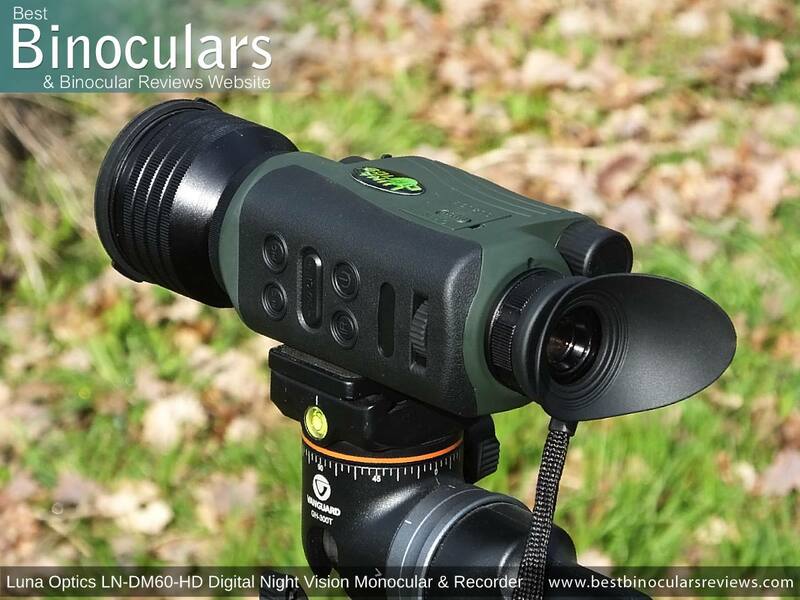 Whilst the Luna Optics LN-DM60 Night Vision monocular is not fully waterproof, it is water-resistant and so would handle most reasonable conditions that you throw at it. Remember with these devices you are not actually looking through the lens of the instrument, but rather onto a screen inside. So before focusing onto an object, you need to set it up to ensure that the eye-piece is focused onto the screen for your particular eye-sight. This simple setup is simple and you just have to turn the ring located just in front of the main eyepiece housing until you get as sharp image. Once this step is completed, you only have to repeat it it gets moved, or if perhaps you share the monocular with someone else. 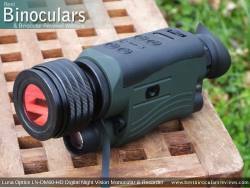 Then to focus the Luna Optics LN-DM60-HD monocular onto an object you twist the main objective lens barrel. As you move around and look at objects at different distances you will have to make these adjustments all the time. It is because of this it is important that this is easy to do, which I can happily report is the case on this monocular. The lens turns with just about the right level of resistance to not make it too difficult, but at the same time not too loose so that it moves by accident. To get the best quality images and video, it is important to mount the LN-DM60- HD onto a tripod. 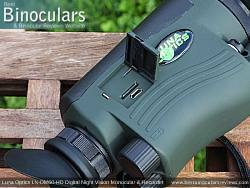 Luna Optics have made this really simple as there is a tripod thread on the side of the body. Whilst it would have been easier had this been on the underside, this was not really a major deal for viewing as I quickly got used to it. However unless you are happy to shoot all your footage in portrait, you will want to fix this. I was also lucky in that my tripod head allows me to flip it 90°, but you can also easily and cheaply obtain an L-shaped bracket that will rectify this problem. 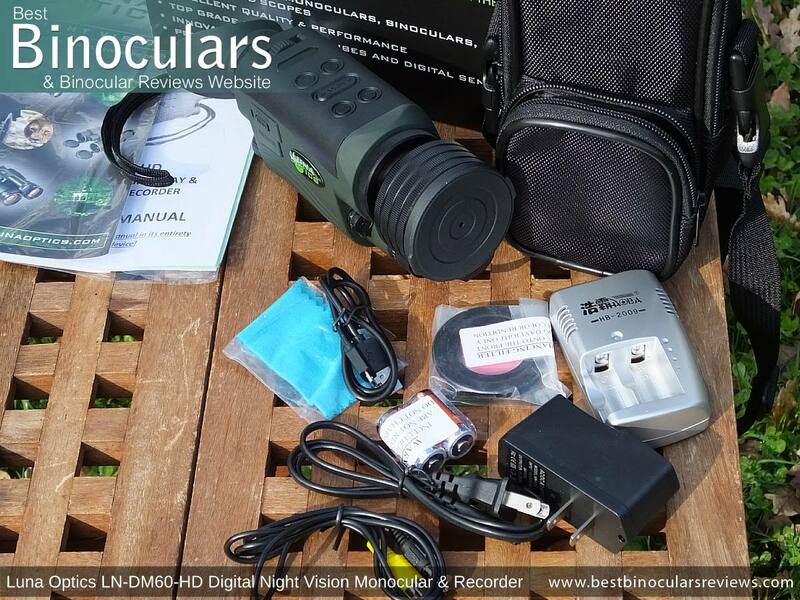 This and many of the other digital night vision binoculars and monoculars from Luna Optics are now able to connect to your wi-fi network. This along with the WiFi Action Camera APP means you can now also control the monocular remotely using your Android phone/tablet or your iPhone/iPad. For details and how to connect, you can download the instructions here (pdf 270kb). Other than to state that the LN-DM60-HD has "precision all-glass optics", Luna Optics really do not mention any details as to the make-up of the optical system and so I really cannot expand or comment a lot here. 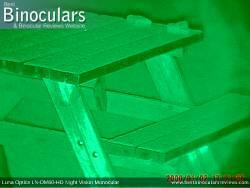 However they do divulge to us that the optics are Multicoated, meaning that some (usually the outer lens surfaces) have multiple coatings of an anti-reflection material. 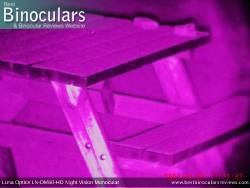 What this does is improve image brightness and quality compared to untreated glass, or glass with only single layer coatings. Luna Optics do not state it, but I measured the objective lens to have a 50mm diameter, which is an improvement on the 40mm that you get on the Luna Optics LN-DM50-HRSD. 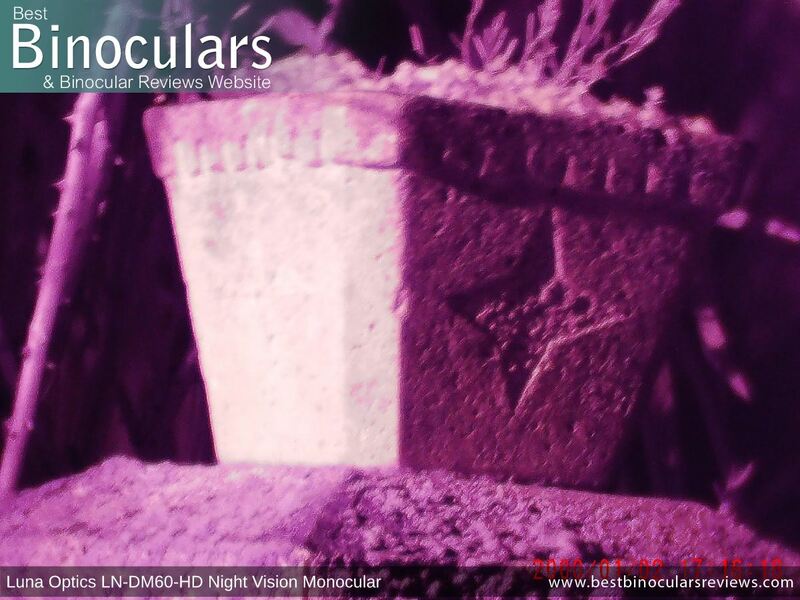 Whilst this has undoubtedly added to the weight and size of the monocular, I think it is a good move as the larger lens is able to capture more light and this deliver a better and brighter image (This is the main reason why astronomy binoculars have larger objective lenses. 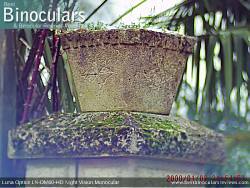 The ocular lens is about 15mm in diameter, which is the same as on their DM50 device. 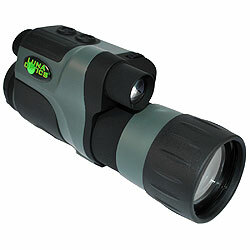 The Luna Optics LN-DM60-HD Night vision monocular comes with a 6x optical magnification. Which for night vision is high. 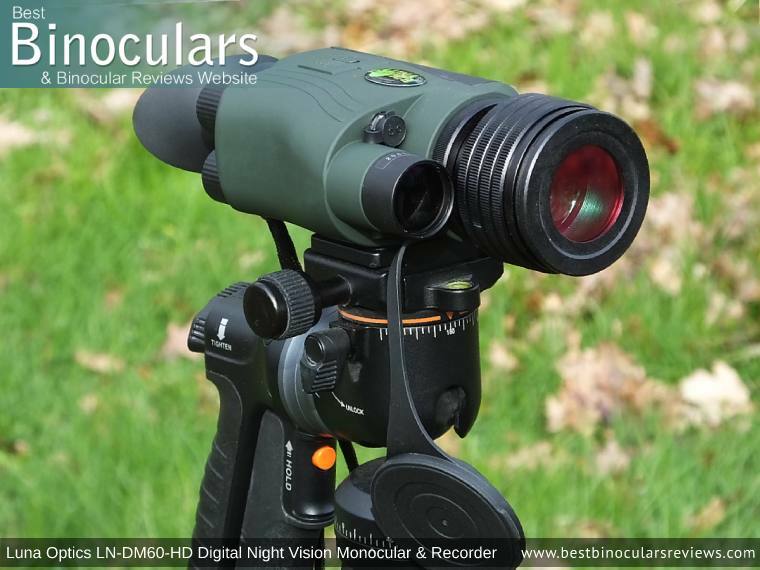 On top of this you can adjust the magnification digitally up to 5x the optical power giving you a maximum zoom of 30x (6x5), which means that these now take over from the Luna Optics LN-DM50-HRSD as being the most powerful night vision device that I have used. 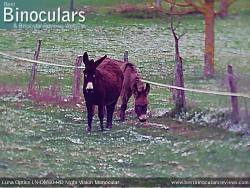 In the marketing material Luna Optics make a point of mentioning that that their "state-of-the-art electronic zoom system" enables the 5x digital zoom to provide "clear images without noticeable pixilation!". I will only partially agree to this. Sure in the viewfinder the image looks normal, but if you take a photo or video at this high power, you do notice the difference in quality when compared to the 6x optical zoom. This is of course perfectly understandable and normal and what i would expect to see, so I just wish they would say so up front. 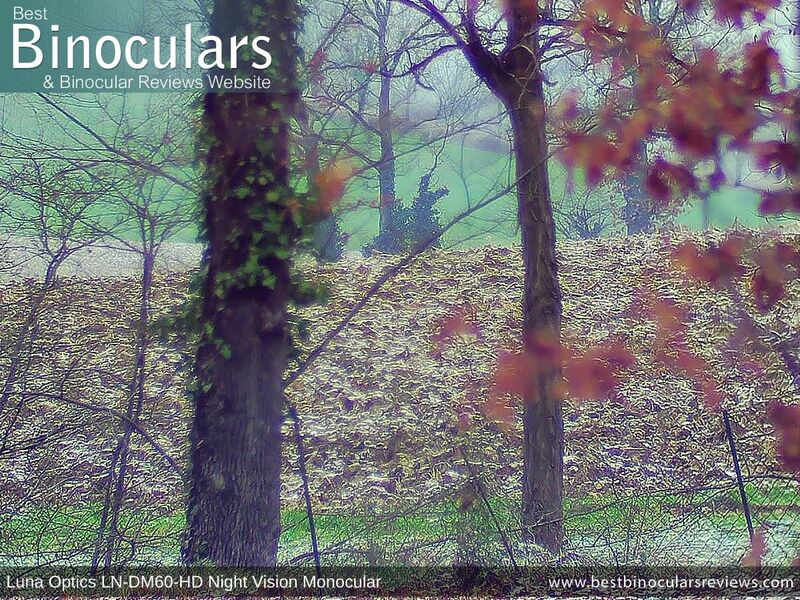 The 7° FOV (at 6x magnification) is good and beats the LN-DM50 even though it has a higher power which is impressive. 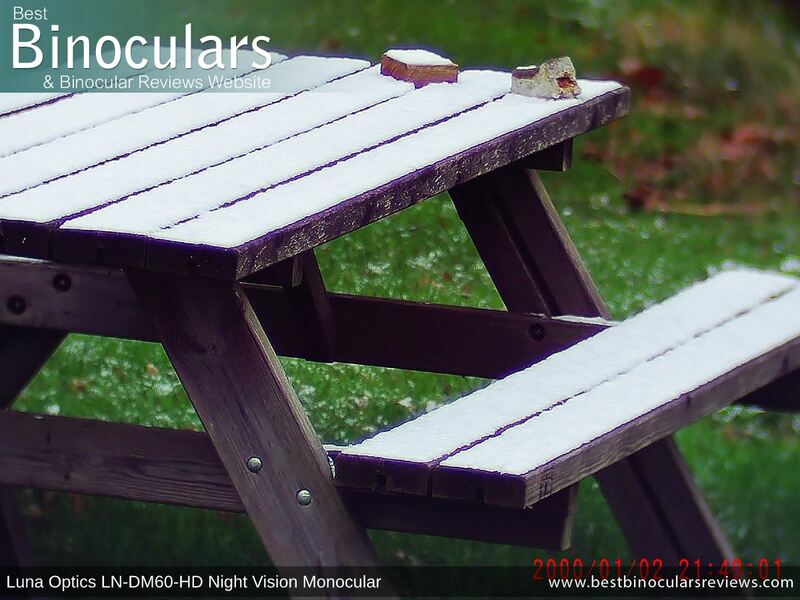 This is important because a wide FOV makes it far easier to find and the follow what you are looking for, which at night with less visibility is even more difficult than during the day. 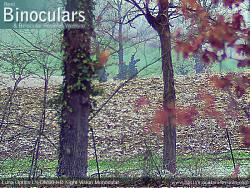 At only 80cm (2.6ft), the minimum focus distance is great. 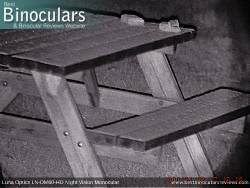 For most this will be irrelevant, however having said that I can see how these would be useful at night for observing insects or frogs from closer ranges, which would be really interesting. 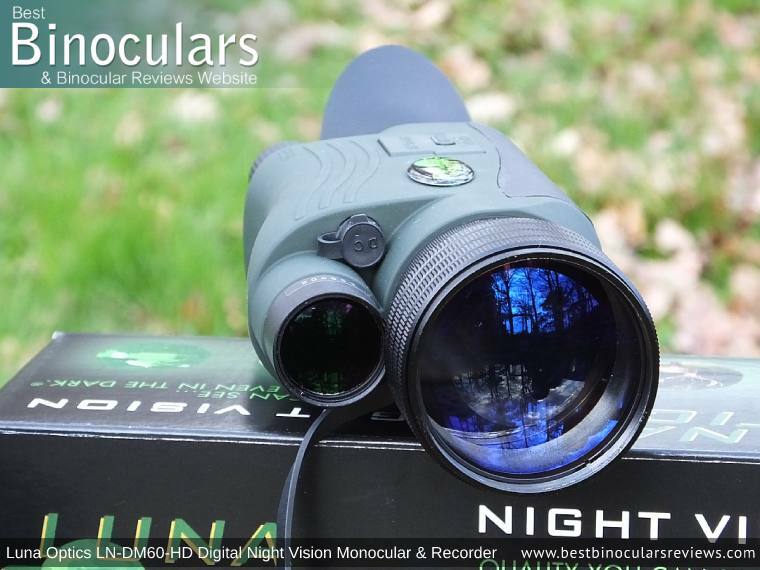 As with all of their other NV devices that I have used, these Luna Optics monoculars has a built-in IR (Infrared) illuminator. Located under the objective lens, it basically performs as a torch would for the unit, but to our eyes is invisible. So in really dark conditions, it simply lights up these scene. It works extremely well which you can clearly see this working in my example photos, but especially in the video below. 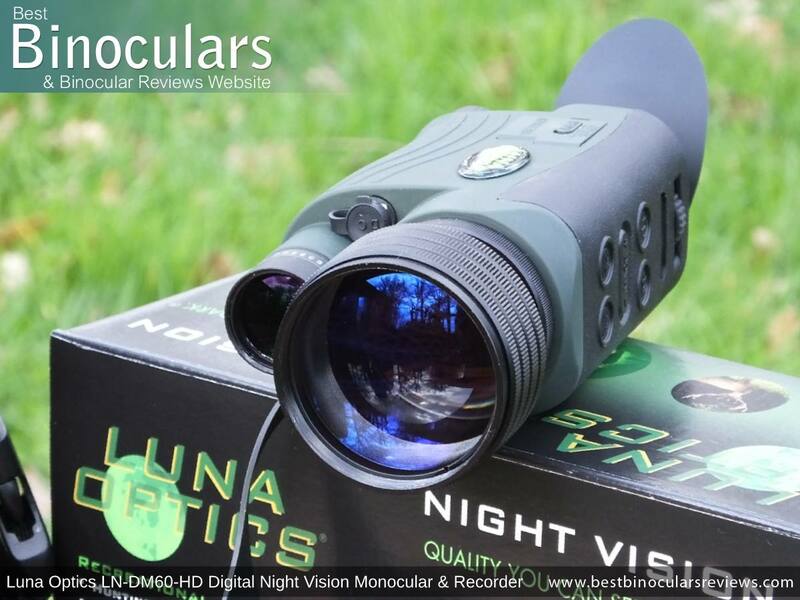 Luna Optics do not specify it's exact specifications which is a shame, but I found that it's effective maximum distance to be about 100m which is on a par with most others that I have used. Max Viewing Distance: 200m (656ft) - 600m (1968yft) 250m (820ft) 250m (820ft) 250m (820ft) ? 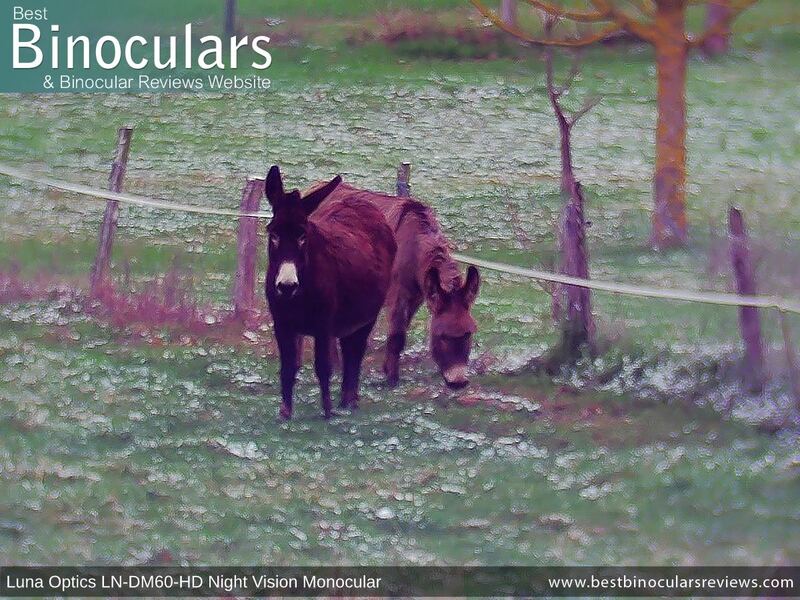 The Luna Optics LN-DM60-HD takes 2.1MP still images in JPEG format with dimensions of 1440x1080 which is a good improvement on their previous models and is really great to see as this was my one gripe about the LN-DM50. Whilst I captured the example photos below during the day, I have to mention that the light conditions were not great. Indeed it was very overcast and misty, which is why I think the results are particularly impressive as they are certainly better than those I have taken using other similar devices. Note: The only editing I have done is to add my logo to the image (Click on each image to view the full sized version). 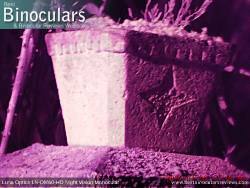 All the examples below were taken with the Luna Optics LN-DM60-HD at night. In the first example of the pot, there was some ambient light coming from a timed security light on my house, this one was taken in full color mode. With second and third ones, the timed light had switched off and so it was really dark. I captured the image in black and white and then green for you to compare. 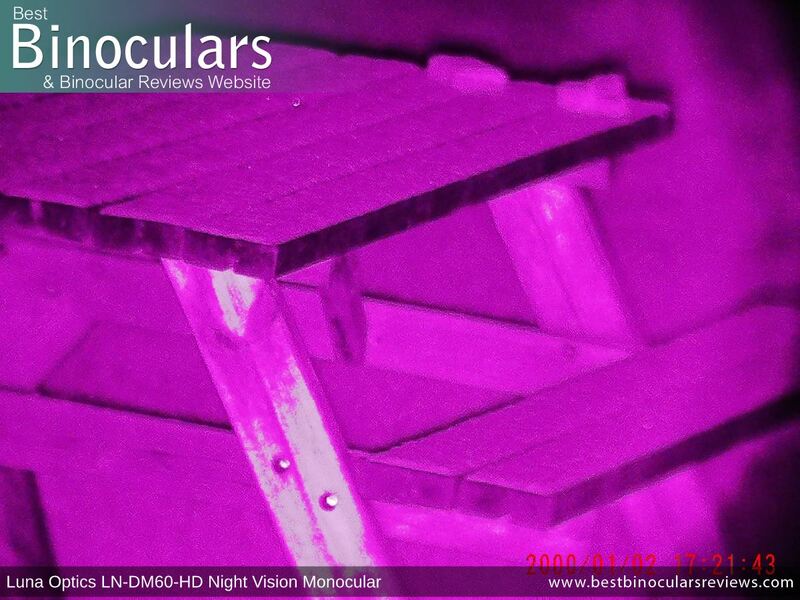 The images of the picnic table (above and below) were taken in complete darkness using the IR illuminator. Note It was a completely overcast night (so no moon or stars) and where I currently live is out on a farm, so far away from any neighbors or street lights and there were no lights on from my house - it was completely dark! 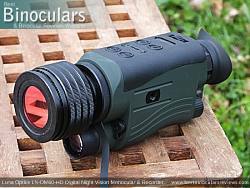 The integrated IR (Infrared illuminator) on the Luna Optics LN-DM60-HD night vision monocular basically works like a torch for the device. As with a normal torch, it is only really effective over shorter distances. From my experience I would say that the maximum effectiveness of this is about 100m. In the short video below, I have some example daytime and night time footage. It demonstrates the quality of image produced at different light levels and from different distances. it also illustrates the effectiveness of the IR and changing from color, to green and then black and white images. Note: All the footage on this video was taken hand held and without the use of a tripod, which I think gives you a good idea as to how stable you can keep the image without help. Also improved on the new LN-DM60-HD is the LCD screen. At .26" 800x640, it is now larger which is good. With mobile phones, I think we have all gotten used to being able to instantly see really high definition images, but viewfinders don't ever quite match up to this. However for a digital NV device, the viewfinder on these is about as good as I have seen or used. 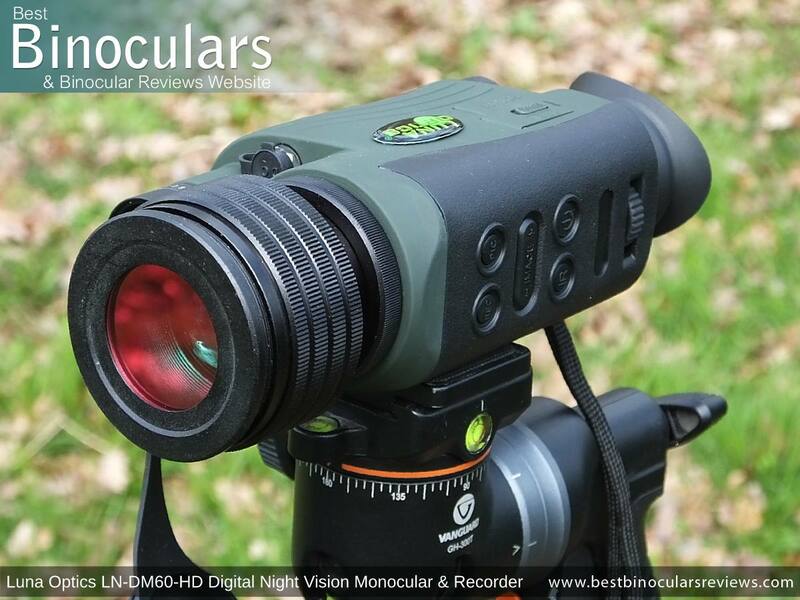 The Luna Optics LN-DM60-HD digital night vision monocular comes packed with such massive array of goodies, it is difficult to know where to start! Whilst the batteries that come included are not rechargeable, Luna Optics have been kind enough to supply the unit with a battery charger, this is definitely not something that I would have expected, but is a nice touch. The objective lens is threaded and thus accepts filters. Luna Optics have included a "Color Enhancing Filter" with this that is intended for use during the day. Without it, the image that is recorded is rather dull and lacks color. So this is a great addition and certainly an improvement on the DM-50 which did not have this included. Whilst not the most padded case I have ever seen,it is well made and very functional. 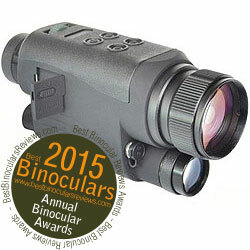 When fully unzipped, the large opening enables you to easily access or replace the monocular. However whilst a Zip is a very secure way of closing a case, you may need to be careful when using it should you wish to remain undetected at night. Here I am thinking more of those with security or hunting uses in mind. On the rear of the case is a belt loop and there is a separate zipped pouch on the front of the case where you can securely store the cables, adapter and included cleaning cloth. The case also has a shoulder strap that can be removed via a couple of quick release clips. The soft plastic/hard rubber objective lens cover attaches perfectly onto the end of the lens, with or without the filter on. This is somewhat important as I have used filters on devices before (usually cameras and camcorders) and with them attached, you cannot then attach the lens cap which is annoying. I also like the fact that the cover is tethered to the body of the device. 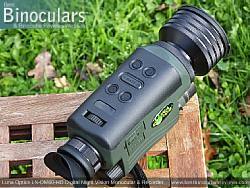 With a daytime monocular this is a nice feature, but for a night vision device like this, I think it is essential to ensure that you don't loose it. These Luna Optics Digital NV monoculars are also bundled with a DC adapter with US plug (EU plug adapter included for International customers) (110V/240V compatible) and there is a Video and USB Cable. You do get a cleaning cloth provided, the quality of it is sufficient for cleaning the body and perhaps very light dusting of the lens when out in the field. For thorough cleaning, I suggest investing in a lens cleaning kit to ensure you do not mark or damage the lenses. The Luna included manual is quite brief, but does a reasonably good job of explaining how digital night vision works as well as going over how to setup and use the device, installing batteries etc. I do however feel that in some areas it should be a little more comprehensive. you can view a PDF version of the manual here. Also included within the manual are details on the one year warranty and the registration information. 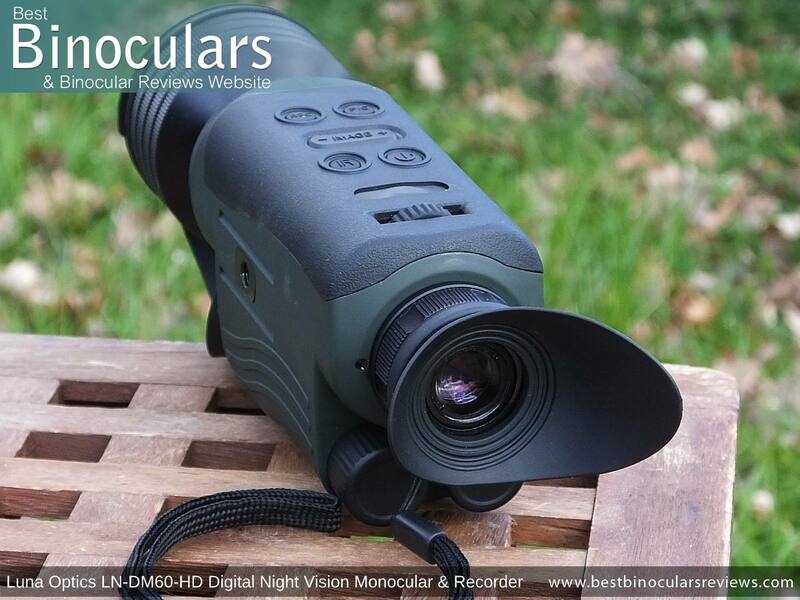 Strong Points: As with other similar devices, the real strength of a "Digital Night Vision Monocular & Recorder" is their versatility, which with the addition of WiFi has now progressed even further. 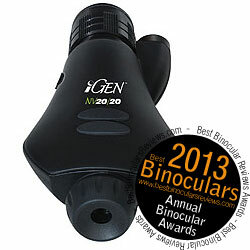 Use it in the day or night for just observation, or to take photos and video. 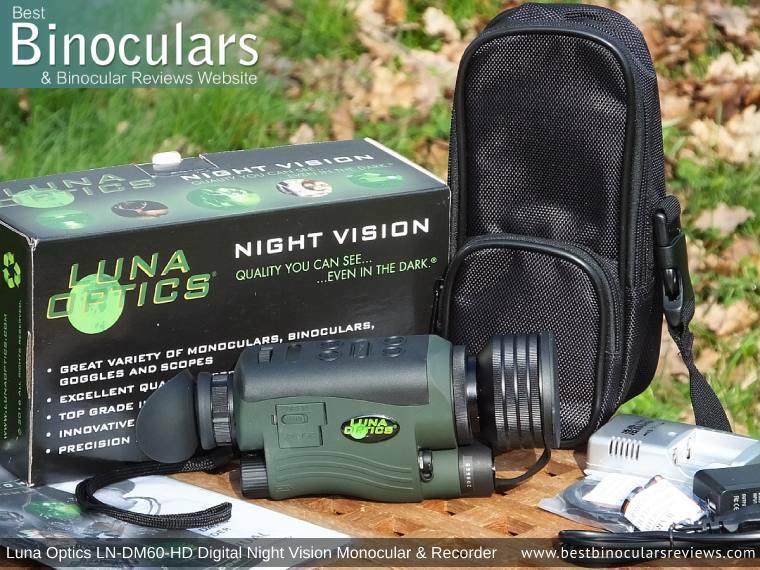 As with every other Luna Optics Night Vision device that I have used, the build quality on this is excellent: it is sturdy and looks very well made. If you take into account that these have a very powerful 6x magnification, the performance in very dark conditions is surprisingly good. 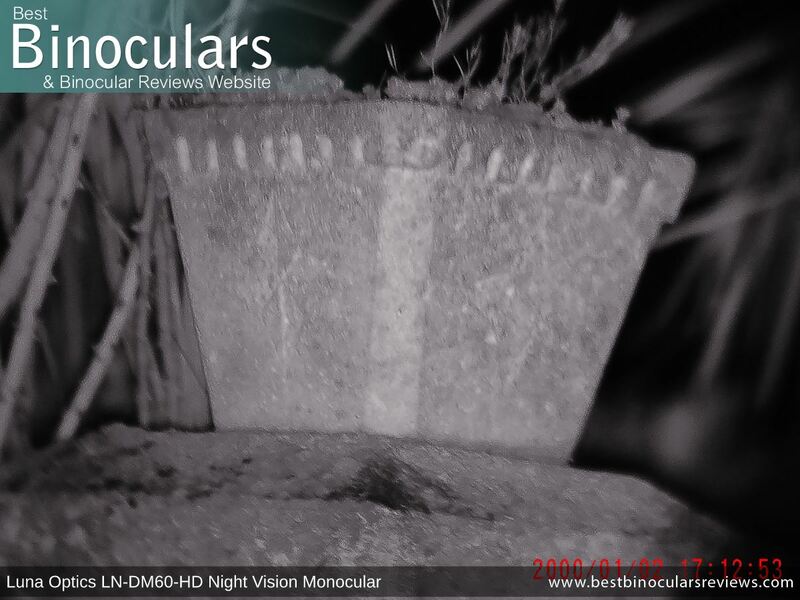 However it is once you turn on the really powerful IR illuminator that the Luna Optics LN-DM60-HD night vision monocular really comes into it's own. 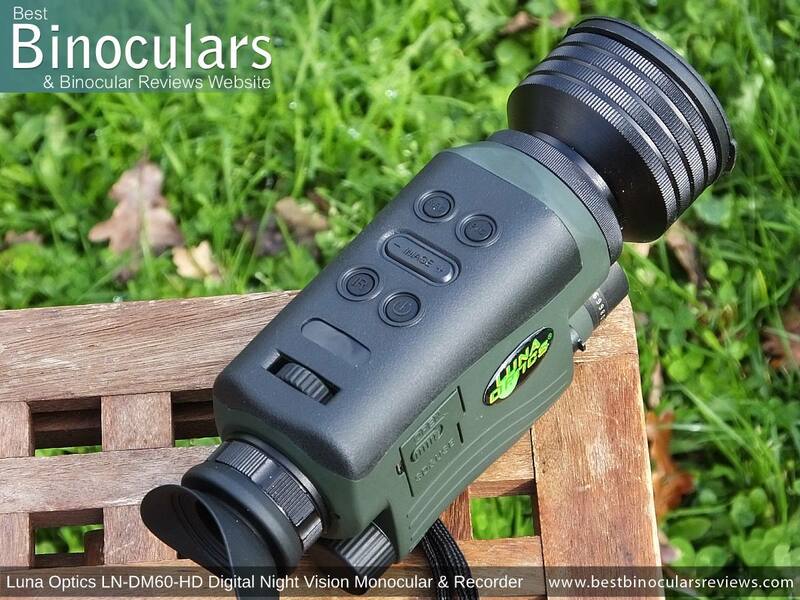 This combined with the ability to record in true HD is what really sets this apart from older versions as well as your more standard night vision monocular. Weaknesses: For winter, it would be great if the buttons were more obvious and thus enable you to use them whilst wearing gloves. The position of the IR illuminator is a little awkward in that you have to be careful when changing the focus on the lens not to get in the way of the beam of light. But perhaps this was just how I was using it? 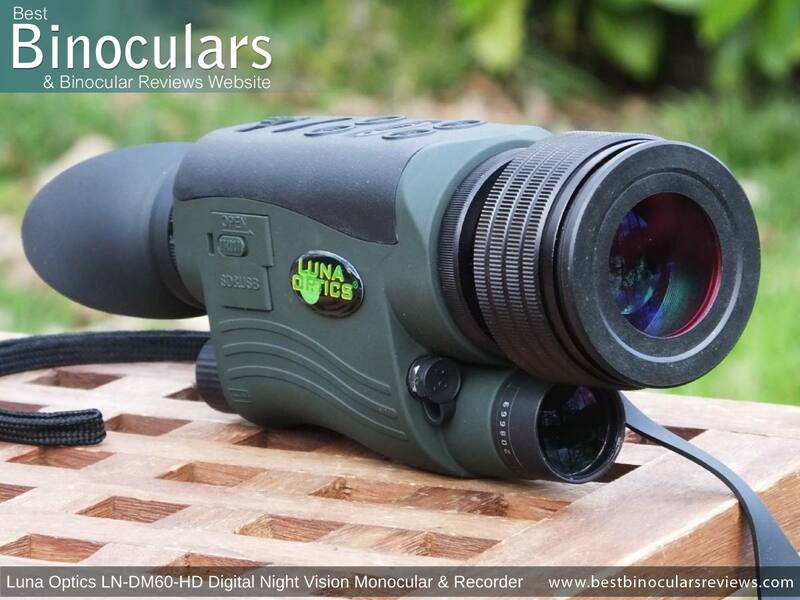 Ideal Uses: The Luna Optics LN-DM60-HD night vision monocular is perfect for many security needs and uses, an ideal device for using on many types of night hunting, but especially from a hide. Many people use night vision for astronomy as it really highlights the stars and you see far more than you can with the naked eye and I can also see it as being perfect for taking camping, on overnight fishing trips or on adventures like safaris. Update: Luna Optics have also added an option of selecting the ISO setting in their latest software update. In particular this really helps stargazers as you are able to constantly operate the unit on highest sensitivity settings (1600-6400) which helps you observe the tiniest objects in the night skies.